It provides comprehensive environmental data on nine different measurements with the simplicity of the Kestrel 1000. Simply turn it on and scroll left and right to see exactly what the environment is doing. 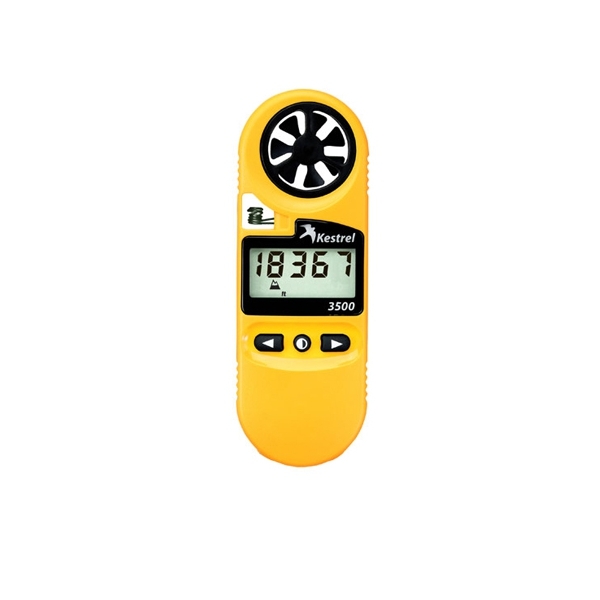 When you’re done, slip on the hard cover and your Kestrel 3500 Pocket Wind Meter is just about indestructible﻿. While the weather can dictate the comfort level of individuals working or playing outside, it plays an even bigger part in many professionals’ jobs. Irrigation professionals use the Kestrel 3500 to ensure they are irrigating efficiently and the water they are dispersing is actually hitting their intended target, and not evaporating or blowing away. And on construction sites Kestrel users are preventing plastic shrinkage cracks and curing concrete more effectively with their Kestrel 3500. · ﻿Air, water, and snow temperature.